The attoclock, illustrated here, can measure laser pulses that last billionths of a billionth of a second long. Unless you're a superhero like The Flash, the molecular world moves faster than any human can possibly perceive. For example, it takes a few hundred attoseconds for a tiny electron to move from one side of an atom to the other during a chemical reaction. What's an attosecond, you ask? First, divide 1 second into a billion pieces. Now, divide one of those pieces into another billion fragments. That's an attosecond: one-billionth of one-billionth of 1 second (or 1 x 10^ minus 18 seconds). "There are half as many seconds in the age of the universe as there are attoseconds in one second," study co-author Ryan Coffee, a senior scientist at SLAC and the Stanford PULSE Institute, told Live Science. "One hundred attoseconds (one-tenth of one-millionth of one-billionth of a second) is the potential resolution of our measurement device." The SLAC Laboratory is home to some of the fastest X-ray lasers in the world, capable of firing pulses that last just a few dozen attoseconds apiece. When directed at individual atoms and molecules, flashes that fast can essentially make what SLAC calls "molecular movies" — a series of pictures taken on the attosecond timescale, capturing chemistry in motion. But one problem with photographing quantum-physics events is that, until now, there wasn't a very reliable way of measuring how fast or how powerful those ultrafast X-ray blasts really were — and without precise measurements, scientists couldn't interpret the data they collected from these molecular movies. In their recent paper, Coffee and his colleagues described a new method of molecular timekeeping called an "attoclock." The device was first proposed by Swiss physicists 10 years ago, but according to Coffee, it is only beginning to reach its incredible potential with experiments like SLAC's. The attoclock is about 2 feet (0.6 meters) in diameter and sits inside a small vacuum chamber in the SLAC lab. The clock is made of 16 cylindrical detectors arrayed in a circle like the spokes of a wagon wheel (or, if you prefer, the numbers on the face of a clock). To start the clock, a target atom or molecule is placed at the center of the circle, where it gets blasted by an ultrafast pulse from one of the lab's attosecond lasers. When the pulse strikes the atom, the atom becomes ionized and casts off some of its electrons. The laser's rotating electric field helps guide those free electrons toward one of the 16 detectors. 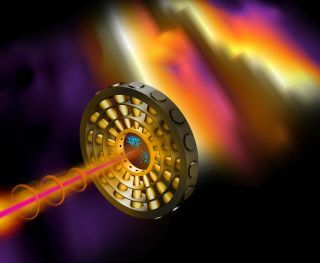 The researchers can tell precisely how much energy was in the laser blast and when it hit the target by tracking where the electrons land. "It's like reading a watch," Coffee summarized in a statement. "An electron may strike a detector positioned at one o'clock or three o'clock or anywhere around the clock face. We can tell from where it hits exactly when it was generated by the X-ray pulse." According to Coffee, the team's attoclock experiments worked even better than expected, and technology upgrades will only make the device more accurate in the coming years. "With that level of detail, we can discern completely new chemical behavior," Coffee said. During chemical reactions, the lab's ultraprecise molecular movies could capture the behavior of individual molecules with unbelievable clarity. Further experiments could even help explain phenomena like chirality — nature's predisposition for right- or left-handed molecules — based on the way molecules move and change in the middle of reactions. "We can start to look at why nature made molecules the shapes that she did," Coffee said. Stay tuned for more atomic updates over the next few years. It'll only take a few septillion attoseconds.